Surfing, just like every other extreme sport, can give you a thrill like no other. If you’re a pro, that is; never face the waves as a rookie. However, even the pros will tell you that the right gear is required when you come face to face with one of nature’s most dominant forces. Since you won’t want to go into the ocean unprotected from the elements, best surfing wetsuits are incredibly essential. The only question is which one you’ll be donning the next time you hit the beach. Surfing, diving, and any other water-related sport just got better with the O’Neill Men’s Reactor 3/2mm Back Zip Full Wetsuit. The coldest of waters has nothing on this wetsuit, protecting you from temperatures ranging from 68°F to 79°F. Like most full body wetsuits, you will have little to worry about showing a patch of skin in this gear. It covers your legs, arms and protects your body from scratches and cuts. If you hate clothes that restrict your movement, the neoprene material in this suit is top-notch for easy movement and it doubles as an insulator. We love the seamless paneling on this wetsuit, with a smooth feel that doesn’t irritate your skin one bit. With O’Neill’s Reactor, you can have it all. Heck, you can even ride the wave with your car keys, because the hidden internal key pouch will have them locked up, tighter than a cell in Alcatraz. You can combine it with cool wakesurf boards from our list. If you’re not a big fan of the O’Neill’s, then you should purchase its close competitor—the Dark Lightning Premium CR Neoprene Wetsuit. You might not get the benefit of swimming at 68°F + of cold water like the O’Neill’s, but you can definitely swim in 46 °F – 55 °F, which isn’t that bad. This suit was made with amateur swimmers in mind. When you’re just starting out, you’ll need protection from cold water temperatures, jelly fish bites and the sun. This suit has all that wrapped up in its lockers. Pop this wetsuit on and experience its impressive flatlock interior, which has zero line-thread. If you haven’t purchased a wetsuit before, you’re wondering, what that means, right? It means a combo of zero irritation, and 100% comfort. Who doesn’t want all of that while snorkeling? You also get to choose between two suits depending on your level of expertise—you can get the 3/2mm design for swimming in cold temperatures of 59 °F +, and you can get the 5/4mm design for swimming in freezing temperatures of 46 °F – 55 °F. But if you’re a daredevil and these temperatures just don’t cut it, then choose our best choice- The O’Neill Reactor. You’ll also love the heavy-duty back zipper of this wetsuit, making it easy to jump in and out of the suit. There’s so much going for this model from Dark Lightning but it’s not targeted at professionals. Make sure you also check our guide to the best water socks. You’re probably on a budget, and we’re trying to save you some cash, so coming in at third place is one of the most budget-friendly suits for all your water activities. The Lemorecn Wetsuit is affordable, but that does not make it cheap, so don’t skip this product just yet. Despite its price point, it comes fully loaded. You’ll find it spot taped at stress points, a smooth interior and exterior surface using the flatlock seam. For warmth and protection in the cold water, the Lemocrecn 3mm has you covered in this area, using a neoprene material. This suit pretty much has everything you need in a wetsuit, but it’s not a full-length suit. The length of the sleeves reaches your upper arm, and the lower part reaches just your upper thighs. It’s well suited for surfers who aren’t afraid of a little sun and cold-water iciness from once in a while. If you also struggle with zippers, the heavy-duty #10 YKK zipper is an easy reach. That’s got to add to its appeal, no doubt. This also makes a perfect gift for swimmers in your life. 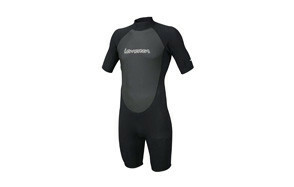 This model is similar to the Lemorecn wetsuit above, the sleek design of the Lemorecn Wetsuits Mens Neoprene 3mm Shorty Diving Suit is suited for people that enjoy sporting a good half-length sleeve that frees your legs and elbows. Sometimes, people need to feel the wave and the wind in their body, but be careful not to dive into areas with freezing temperatures with this suit. Envelope your body in this 3mm neoprene suit and seal the deal with its heavy duty #10 YKK zipper that gets you in and out in a flash. The flatlock seam design of this wetsuit keeps water out and allows you to paddleboard for as long as you want. We’re excited at how comfortable it feels to sit in one of these babies, making it a great bet for snorkeling under the sun. Short suits can be fun for diving as well but be careful and stay clear of cold water temperatures. If you’re sporting a short suit, the last place you want to be in is freezing water. Our handy guide to the best swimming trunks features more great products like this. O’Neill obviously knows how to make wetsuits that appeal to everyone. This option was included in our review for those who feel our best choice from O’Neill is too much coverage for them. Waddle over to the O’Neill Men’s Reactor-2 2mm Back Zip Short Sleeve Spring Wetsuit for an experience of a lifetime. The sleeves stop on your upper arms, while the lower section stops right at your thighs. You’ll enjoy the warm ocean water caress your legs while you paddle on your surfboard. O’Neill’s unique water-resistant back zip closure prevents cold water from escaping through the zip—the main reason why you have a wetsuit on in the first place, to keep water out. We believe O’Neill focused more on the insulation than on comfort and mobility with this model. We love the Wind-Resistant Smoothskin that provides extra insulation and protection against the cold. However, unlike the other offerings from O’Neill, this option comes with minimal seam placement, which barely does justice for comfort and maximum mobility. As with other models from this manufacturer, there is a hidden key pocket where you can place your car keys or wedding bands for safe keeping while you surf and visualize what paradise would feel like. 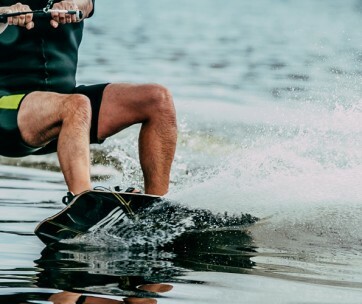 Find more great products like this by checking out our guide to the best kneeboards. While this winter wetsuit won’t necessarily transform you into Marvel comics Superhero Quicksilver, you’ll definitely feel like a surfing god in the Quiksilver Mens 5/4/3mm Syncro GBS BZ Full Wetsuit. The whole structure and design of this wetsuit is exquisitely sleek and “superhero-like,” but you’ll have to splurge a little more if you want to feel this luxurious wetsuit on your body. With the Quiksilver wetsuit, you can close your eyes and dive into water temperatures of 51°F to 58°F and feel the warmth and superb toastiness of the Quiksilver’s Thermal Smoothie and WarmFlight x2 Infrared thermal lining combined with its F’n tape that also keeps the seams watertight. Think it’s a beauty to behold from the outside? Wait till you put this suit on. Most of the features of the Quiksilver wetsuit (much like its name) are unique like the Ecto-Flex knee pad that is lightweight and protects your knees while surfing the ocean. Why is this important? It is. Trust us, you don’t want to show up with a bad knee. A misbehaving knee can have a negative impact on how long you surf. Quiksilver added features to this wetsuit that you’ll probably never see on any other suit at this price point. We went animated when we saw the inclusion of the F’n LITE 2 neoprene material that allows you to move and groove with your surfboard—it is entirely lightweight, and you still get optimum flexibility. 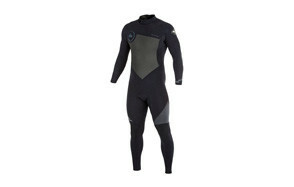 We also found the Diamond Deluxe feature of the Quiksilver wetsuit interesting for pro surfers. This is a keeper. Don’t forget to also check our guide to the best swimming goggles which might come in handy. Billabong suit can do all things. It’s for those who always want a little extra in their activities. You should get this wetsuit if you’re ready to splurge a little more and you want the crème de la crème of wetsuits. 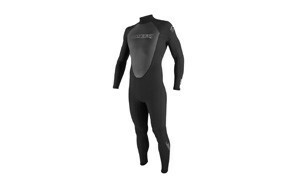 Dive, kayak, paddle board or surf in freezing water temps of 57°F to 66°F in this wetsuit and enjoy the warmth and comfort it caresses your body with. You’ll love the 25% stretch of this suit too, well, we did. The stretch makes it versatile for various wetsuit sizes. 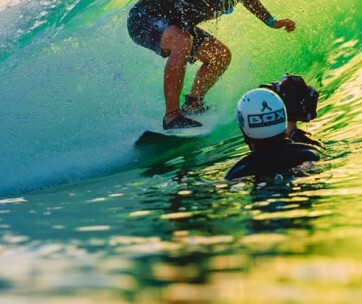 Billabong Men’s Foil wetsuit comes with a lightweight high-foam that provides insane thermal retention enough to keep the cold away while riding the wave. Once you’re done with your activities, you can quickly get it off the same you put it on thanks to the internal back zip—made up of a #10 YKK durable metal slider—the best in the game. If you like water sports, check out our guide to the best snorkeling masks. There are quite a lot of things to cherish and admire this beautiful wetsuit. However, one thing that the manufacturers definitely got right was the proper mix of aesthetic appeal and functionality with this one. A full black design provides a highly modern and premium look, and all edges and mesh lines are clearly marked. The Dawn Patrol full wetsuit was manufactured by Rip Curl, one of the most popular manufacturers of diving gear and wetsuits in the world. Coming from a long line of awesome wears, this option brings an awesome update, as its arms are fitted with E5 and the very stretchy free-flex neoprene material. In this design, you also get features such as thermal lining (which provides adequate protection against the cold waters), flashlining mesh chest panel, and an internal E5 tape. You also don’t have to worry about affordability as well. Its pricing is pretty accommodative, and you’ll find that you will definitely get proper value for every penny you pay. Brand - Yes, we know; the consensus about picking products for reviews (or really, any other aspect of the purchasing process) is to ensure that you are never swayed by brand names or any of the popular brands. In truth, there's a lot of veracity to this; the fact that a famous manufacturer designs a product doesn't necessarily mean that it's going to perform much better than any of the offerings being pushed out by the newer brands. However, when it comes to men's wetsuits, it's safe to say that brand names sit on the Iron Throne. But, we didn't let any names sway our choice, and our selection is from an objective point of view. However, given the fact that most of the popular wetsuit brands have a history of optimum performance, it was easy for them to drop the new producers in the dust and claim top spot in our reviews. Reviews - This is pretty much axiomatic, isn't it? Considering the fact that you could easily get one thing written about a product on the manufacturer's website and see things are not as they seem to be. So, we were careful about what products made it to the list. To wit, we went to various retailer platforms and took a look at reviews from customers and how likely they were to recommend the wetsuits to friends and families.Those whose reviews matched the specifications given by the manufacturers showed a lot of product integrity, and it was quite easy to have them placed on the list of best surfing wetsuits as well. Price - The price of a product is critical. It's one of the most significant point that people experience when it comes to making purchases of any kind. If a product is considered too expensive, then there's no way they spend on it and vice versa. But, there are exceptions to the case. A product that is expected to be expensive but is being sold at a giveaway price could fuel suspicion of being inferior or a damaged good. In reality, the truth is that you can't expect to get proper quality from a product without shelling out the type of money that reflects your expectations. The same rule goes for purchasing a wetsuit. However, there are also times when the cheaper stuff tends to perform pretty well. Depending on what your needs are, you can get excellent service from affordable options. Full body wetsuits might be your preference, and you should know that they are priced differently from individual pieces. With this understanding, we were careful about the prices of the choices we put here. All of our best surfing wetsuits provide a perfect mix of affordability and functionality, ensuring you get proper value for your money.